Hiding from the Computers Part 6: What Is to Be Done? In my last post, I argued that technology-driven productivity gains had to go somewhere, and the data suggested that the recipients were cognitive workers undertaking non-routine tasks (and thus safe from computers) and the holders of technology-based capital—generally the same set of people. At this stage, it is worth stressing that the workplace is a little more complex than a simple grid of non-routine cognitive workers, routine cognitive workers, routine manual workers and non-routine manual workers as in the simplified models that underpin the job polarisation economic literature (click for larger image). 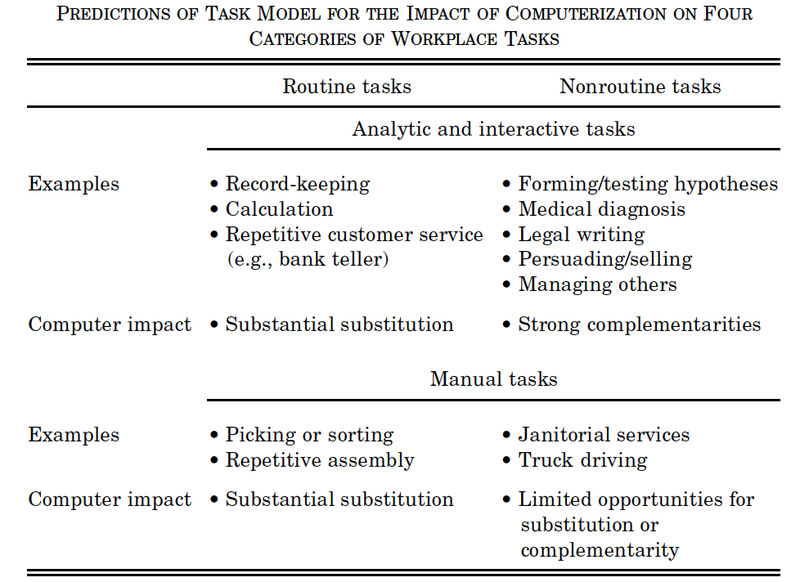 As the chart above shows (from a 2003 paper by Autor, Levy and Murnane), we are really talking about tasks as opposed to jobs. Every type of job will contain elements of the non-routine cognitive and the routine manual, even the most specialist, such as the non-routine cognitive profession of brain surgery, or the most routine, such as production-line work in a meat-packing factory. What technology is doing is disassembling and then reassembling categories of jobs through extracting and then automating the routine elements. The semi-attended customer activated terminals (SACATs) that I covered in my third post in the series are not replacing any individual employee; what they are doing is taking a group of, say, 10 employees and stripping out a subset of their routine tasks until perhaps eight employees’ worth of non-routine cognitive and manual tasks are left. Articles such as Farhad Manjoo’s “Humans 1, Robots 0: Cashiers Trump Self-Checkout Machines at the Grocery Store” in The Wall Street Journal completely miss the point. This is not a straight fight of human against machine over all aspects of a cashier’s work. It is a tussle between human and machine over individual tasks. And the very fact that self-checkouts exist and are proliferating means that the machines are winning individual task battles. Indeed, that is why U.S. Bureau of Labor Statistics show declining cashier numbers as I referenced in Part 3. So Manjoo’s article should really have been titled “Humans 5, Robots 1: Self-Checkout Machines Start Winning Battles Against Cashiers at the Grocery Store”. Once we realise that we are really talking about aggregations of tasks when we are looking at the job market, it is easier to understand the chart below with which I began the series (click for larger image). Take ‘Office and Administrative Support’, for example. The workers who have some defence against technology are those who have concentrated on the non-routine cognitive aspects. But their jobs wills also change as technology keeps looking for ways to reformulate as routine processes bits of their work that currently appear non-routine. When enough of such tasks can be aggregated at the right technological price, a job will be eliminated and the remaining workers will have a different task set than that which existed before. Faced with such a threat to the job market, I ended my last post with two possible policy prescriptions: 1) educate and train routine manual workers to become non-routine cognitive workers or 2) redistribute income from the cognitive workers to the non-routine manual workers. Actually, there are a couple more alternatives: 1) do nothing or 2) carve out more of human life that is not encompassed by the market economy. So what will happen if governments do nothing? Well, the lump of labour skeptics are right about one thing: absent of any social or moral overlay, markets will clear. If technology destroys routine tasks and then goes on to shrink the pot of non-routine manual tasks, the market will fight back by pushing down the wages of workers engaged in non-manual routine work in a struggle to match the price of labour-saving technology. This game will continue for as long as technology advances, until we reach a point where you no longer have a living wage. In my second post, Boxer went to the glue factory as the market progressed toward such equilibrium; but if you prefer an historical rather than literary allusion, you could see this as the poor going to the workhouse in Victorian times. 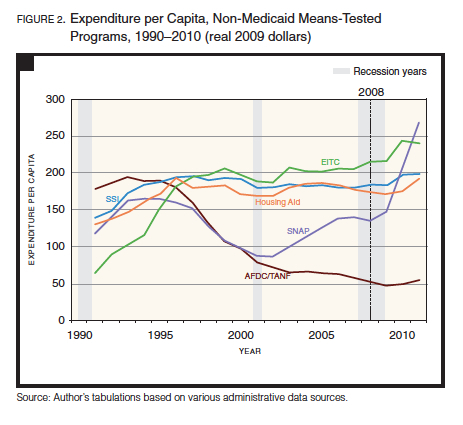 There has been a general uptick in real (inflation-adjusted) levels of spending from around 2000, but the principal driver has been medical-related. 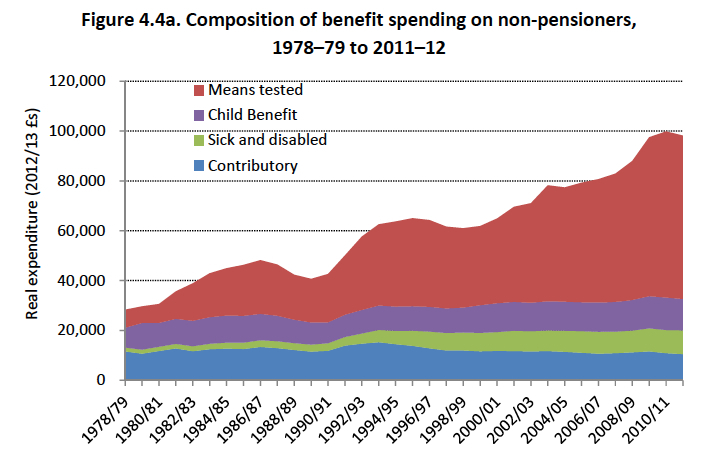 It is very difficult to isolate the extent to which technology (and globalisation) are pushing workers into the safety net since a) many workers have a cushion of social insurance-related benefits they can fall back on for a while if they have previously worked and b) the government has changed the eligibility rules on many programmes. He also visits the disability epicentre of the U.S., Hale County, Alabama, and interviews a doctor on his approach to disability certification. But if you can’t get on disability, then by default you will fall into the means-tested safety net. Looking a bit more closely at the means tested safety net, we see the biggest change in demand being with the Supplemental Nutrition Assistance Program (SNAP, formerly known as Food Stamps). The right of centre suggests that the biggest driver of the SNAP program increase is due to a change in eligibility requirements; see, for example, the Cato Institute report here. 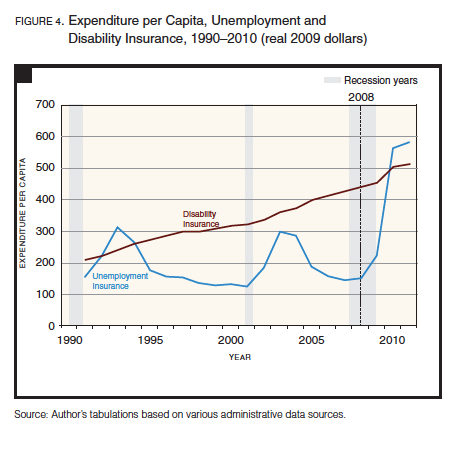 More liberal commentators claim that the rise is because of an exhaustion in social-insurance related benefits due to long-term unemployment and also a decline in the labor market participation rates; see this Center on Budget and Policy Priorities here. 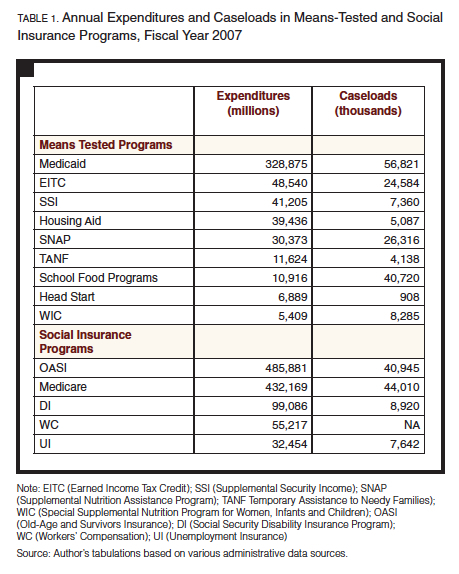 The exact point at which the economy and eligibility for these programs meet is, to me, irrelevant. We have two indisputable long-term trends in median real incomes and in labor force participation. Accordingly, ever more Americans (and the citizens of other advanced countries) will fall into the safety nets. Faced with this trend, it is possible to tighten safety net entry requirements and also reduce safety net benefits, but this will basically mean that more people will fall into poverty (a trend that appears to be starting as can been in this New York Times article here). This is pure economic logic. The only way right-of-centre critiques can counter this inexorable force is by creating an economy that raises the median wage and increases the labour force participation rate—and just doing one of these things alone is not sufficient. So if the “do nothing” approach leads to the destruction of the American dream of upward socioeconomic mobility, what are the alternatives. The first focuses on education—every politician’s favourite palliative. However, this is not a typical call for more years of education or better access to education. Frank Levy and Richard Murnane in “Dancing with Robots” argue that education needs to be retooled to teach a different set of foundational skills that are required to prosper in a high-tech economy. The focus needs to shift from teaching procedural skills, which had huge value when middle class jobs were dominated by routine cognitive and manual tasks, to skills such as conceptual understanding and problem solving, which are a prerequisite in avoiding direct competition with computers. Unfortunately, as the bar for the requisite foundational skills to survive in the modern economy keeps rising, the ability of working class households to supply such skills is actually falling. For example, a famous study by child psychologists Betty Hart and Todd Ridley showed that when a child had reached the age of three, he or she had 45 million words addressed at him or her in a professional family, but only 26 million in a working class family and 11 million in a family on welfare. This is not good for building social abstraction stills. Similarly, being a single parent is a key determinant of child poverty and child poverty reflects on educational performance. While middle class divorce has been declining somewhat in recent years, the chance of a child with a high-school rather than college-educated mother being in a single-parent household rose from one in ten in 1970 to 3 in 10 in 2009. Indeed, the relative gap in both material and time resource between working class and middle class families has been expanding in general. Expenditure on children’s enrichment activities (summer camps, college visits, tutoring and the like) by the top quintile of the income distribution in inflation-adjusted terms rose from $3,700 in the early 70s to $9,400 in 2006. The equivalent numbers for bottom quintile were $833 and $1,391. It is very tough for the state to tip the odds in favour of the working class. Brink Lindsey, in his thought-provoking book “Human Capitalism” sets out in detail how the complexity of the modern world has brought forth demand for workers who can show three kinds of abstraction: intellectual, social and personal. While intellectual abstraction—formal reasoning, understanding broad concepts and utilisation of symbols—can to a degree be taught, social and personal abstraction are rooted in culture. Social abstraction allows an individual to interact within society at a variety of levels and navigate complex corporate and state bureaucracies, while personal abstraction “empowers us to exercise meaningful autonomy through weighing how various choices will affect an imagined future self”. If you are brought up in a household that views outside groups as ‘other’ and to be distrusted, and if you have an inability to defer gratification in pursuit of a visioned life, then you will be unable to foster the necessary foundational skills to cope with non-routine cognitive jobs in a complex society. Lindsey rightly points out that the limited efficacy of conventional educational policies places both the liberal left and libertarian right in a quandary: to allow the current dispossessed to ‘dance with robots’ the state will need to engage in some heavy duty social engineering. Just as Stalin’s Russia tried to create the ‘New Soviet Man’, modern-day policy makers will have to set about creating the ‘New Capitalist Man’ who has all the abstract foundational skills to prosper in a routine-less world of work. Nonetheless, direct social intervention at the family level is a hard sell politically. Tyler Cowen, whose writings have a libertarian taint, thinks we won’t have the stomach for such social engineering. His book “Average Is Over” is really a celebration of the new world of work for the cognitive elite. A world of free-style chess in which advanced degree laden elites hang with computers for fun as much as money. He cares little about the initial 47% who will get trashed by the technology revolution in my first post. The American polity is unlikely to collapse, but we’ll look back on the immediate postwar era as a very special time. Our future will bring more wealthy people than ever before, but also more poor people, including people who do not always have access to public services. Rather than balancing our budget with higher taxes or lower benefits, we will allow the real workers of many workers to fall and thus will allow the creation of a new underclass. An alternative exists to the “let the chips fall where they will’ approach: redistribution. Bard College Professor Walter Russell Mead, in a provocative article in The American Interest, dubs this path “Blade Runner with Food Stamps”. 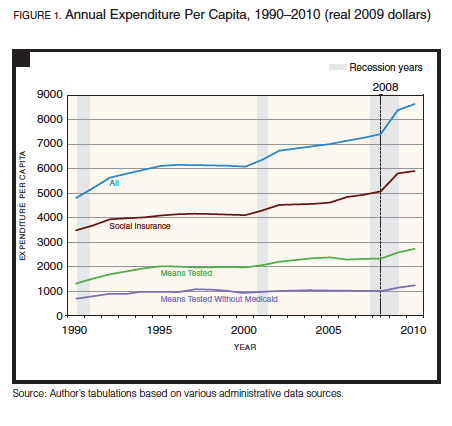 An information age welfare state would consist of two components: straight out welfare and “social inclusion” payments for some, subsidized make-work jobs (like Postal Service employment in an age of email) for others. The money to fund these programs will have to come from corporate profits and from the incomes of those who still manage to surf on the waves of digital change. That suggests rising tax burdens and a constant class struggle between the economically connected citizens who want to keep what they have earned and the clients of the welfare and make-work state. If the information economy works like this, the whole country would start looking more like California and New York City: unbridgeable class divides, huge inequality, fountains of innovation, and tiny islands of great wealth and privilege surrounded by proles on the dole. Inside the glittering bubble, the digirati and their courtiers would live lives of intense purpose and excitement. Outside the bubble, meaning would be the good in scarcest supply. To have a life where your work means something and your hands help steer the world would be the exclusive privilege of a tiny handful of enlightened, intelligent, and energetic people. This is Blade Runner softened by food stamps, but as in the public housing projects and other warehouses where we store “surplus” people today, the most acute form of poverty and deprivation will not be the lack of food, clothing or even shelter. It will be a lack of social connection, of independence founded on achievement, on the human dignity that comes from doing work. Bellies will be full, but lives will be empty, and with that emptiness will come ills of every kind: addiction, brutality, ugly, and stunted sexual and emotional lives for many, neglect of the young and the old. Surprisingly, Brynjolfsson and McAfee appear to have come around to the ‘Blade Runner with Foodstamps’ alternative. In “Race Agains the Machine”, they professed to be optimists in the sense that the third industrial revolution of computing and networks could usher in untold knowledge, wealth and opportunity. Yet they admitted that an ever larger part of the population would be unable to keep up in the race. More recently, a TED talk given by Andrew McAfee tells the story of how two white guys named Ted and Bill are doing in the new economy. Ted, an affluent upper-middle class yuppie, is flourishing; Bill, by contrast, has spiralled down into the classic life of white trash— marred by poverty, unemployment, ill health, divorce and prison. Nonetheless, unlike in the earlier book, McAfee has a solution for this predicament: the introduction of a guaranteed income. The talk is only 15 minutes long, so if you have time I recommended you listen to it. The problem with this approach is that the cognitive elite are loosely rooted in geography. Accordingly, once you start transferring money from this elite to the masses via a guarantee minimum income you run the risk that the elite will decamp to a more cooperative jurisdiction. Globalisation plus technology have made cognitive task-based work extremely footloose. Moreover, climate change shows that we are unable to make any serious decisions at the supranational level, so a guaranteed income seems a non-starter. A much more radical alternative is for the government to consider fostering the development of decentralised micro economies at the local level. This is the kind of thinking outlined by Juliet Schor in her book “True Wealth“, which draws on a lot of the work of the Transition Network. I think you could construct such an economy through building on many of the insights produced by the new happiness economics literature. When I embarked on this series of posts, I expected a three-parter. We are now up to six, yet I feel I have barely touched upon many of the issues raised by technological change and the job market. I will conclude this series of posts for now but will return to this topic in future posts. This entry was posted in Post Growth, Technology and tagged Average Is Over, Blade Runner with Food Stamps, Bladerunner with Foodstamps, Brink Lindsey, Dancing with Robots, Frank Levy, Human Capitalism, Richard Murnane, Robert Moffit, Tyler Cowen, Walter Russell Mead. Bookmark the permalink. Great post! Very thoughtful analysis and overview. Unfortunately, it is difficult to see any good option emerging that will provide meaningful work to everyone within our current economic structure. As far as “decentralised micro economies at the local level” go, it should be kept in mind that complexity goes with scale. A micro economy will be much simpler than a globalized one. Convincing folks that they will be happier without a car, flat-screen TV, refrigerator or microwave oven may be tough, especially if they have friends or relatives still living in the global economy. Thank you. This was a super-good post. I’ve been searching for non-redundant analysis & thinking on this topic but this is one of the more comprehensive, honest & intelligent pieces I’ve seen. More, please. A great series of posts, but a lot of the analysis is based upon neo-classical economic theory. That theory is simply wrong. It doesn’t reflect what happens in a monetary economy. Labour markets do not clear. There is involuntary unemployment and money does not automatically circulate via any sort of ‘loanable funds’ structure. The opposite to the ‘lump of labour’ fallacy is the ‘brain surgeon’ fallacy – that all you need to do to turn somebody into a brain surgeon is ‘educate’ them. Guaranteed income is a pipe dream that can never work – humans need to see reciprocation or they get very irritated cf. Benefits Street. There is still lots to do, just nobody prepared to pay the wages. ‘Moving abroad’ is similarly a mistake of analysis. People still have to sell their output to somebody to earn anything in the first place, and that means imports (because the rest of the world hasn’t got the income to spend on your output either), and imports can be taxed just as easily as earnings. The idea that taxation pays for things is similarly mistaken. If the Elite choose to save, then you can pay wages to the poor without any ‘redistribution’ – because saving in excess of investment is a form of self-taxation. I’d suggest reading up on Modern Monetary Theory (MMT) and the Job Guarantee to get a more pragmatic view on the economics. Bill Mitchell’s blog is a good place to start. Neil. I would argue that the neo-classical approach to technology is not necessarily wrong, but rather not taken to its logical conclusion. 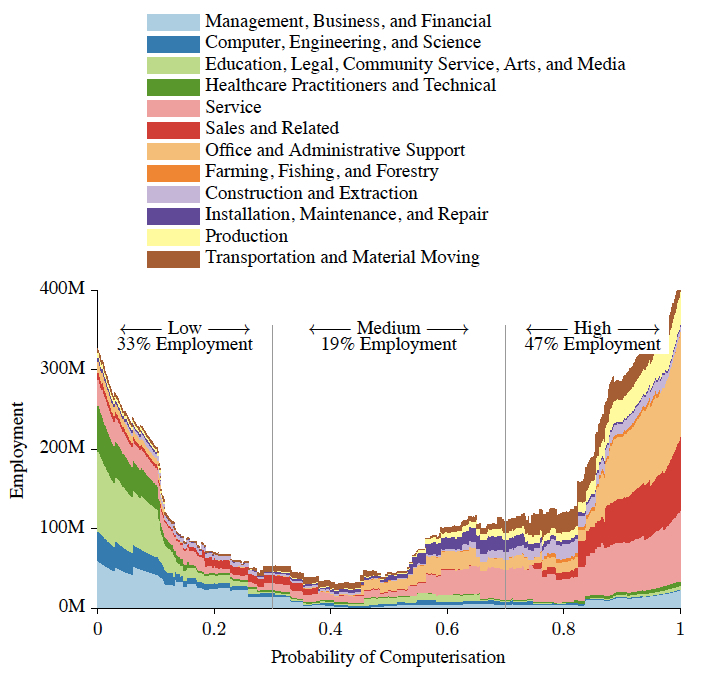 David Autor and co. clearly identified the differing job prospects for routine and non-routine cognitive and manual workers in a world of technological progress but somehow hope that markets will magically clear at a wage rate above impoverishment. However, I understand that an advocate of MMT may finesse this problem. I’ve been thinking along the lines of some parts of MMT before haven’t made my mind up yet. If our only problem were technological abundance, I would be a little less wary of MMT, but we face a strange mix of technological abundance in some areas and resource and climate constraints in others. I need to do more reading and will follow up your Bill Mitchell blog recommendation.